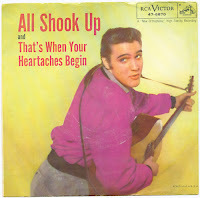 Should Elvis have been 'shaken up"? The song Elvis inspired and then performed gives the phrasal verb to shake up a modern twist. The idea that young love could have a traumatic emotional impact is not novel (see Shakespeare et al) but here it is cleverly linked to Presley's scandalous 'shaking hips' image. There has been a lot of learned discussion as to whether 'shook up' should technically be 'shaken' up - see comments here. What is undeniable is that a (supposedly) grammatically correct version of the lyric would not have have inspired countless Karaoke performances and Elvis impressions. My friends say I'm actin' wild as a bug.